Welcome to Bree Athletic Club. Outdoor Training takes place on Monday and Wednesday evenings at 7pm in the lower field. Indoor Training takes place on Thursday evenings in Bree Hall from 7pm to 7.45pm for 5 to 9 year olds and from 7.45pm to 9pm for 10 year olds and older and Bree AC registered members . ​Club Registration for 2018 take places at Indoor Training. Registration Fees are U8 - 19 - €25, Senior €30, Little Athletics U4 - 7 - €5 if living the Bree Davidstown Community Games area. If living outside this area athletes U4 - 7 must become members of Bree AC at a reduced rate of €15. Until 2005 our Club only catered for juvenile athletes and since then it has expanded to incorporate senior athletes. The development of a 2 lane 100m tartan track and floodlights mean that we can train all year round. Training for our younger athletes commences outdoors in April on Monday and Wednesday nights (For full details click into Training Times). Our older athletes train all year round with exception of a few weeks off at the beginning of September. We also have indoor training for all in Bree Hall on Thursday nights from October to March at 7-7.45pm for the younger age groups and 7.45-9pm for all other members. So whether you are a first time athlete or are coming back to the sport, we at Bree Athletic Club with the help of our experienced coaches and their dedication should be able to cater for your needs. 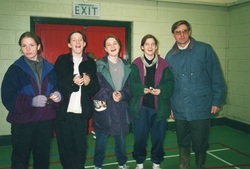 This photograph is from about 1997/98 and shows Pat O'Leary with club athletes.